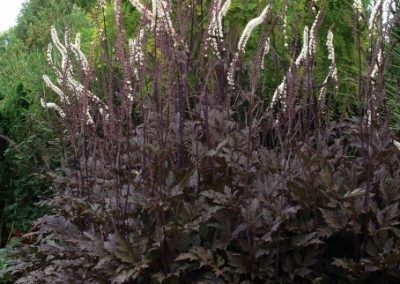 Actaea which belongs to the Ranunculaceae(Buttercup family), is a genus of 27 species of woodland perennials with short rhizomes. These hail from temperate regions of the northern hemisphere. Actea is a transcription of the old Greek plant name: aktaia . 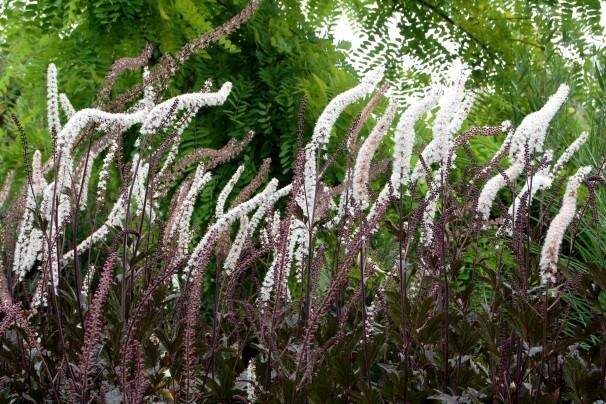 The source of this word is uncertain but some botanists believe that the name Actaea is derived from the Latin word, aktê, the elderberry bush, since the leaves of Actaea resemble more or less the leaves of the elder. Actaea formerly was known as Cimicifuga, from ‘cimex’ a bug and ‘fugo’ which means, to force to flee. The common name of bugbane refers to its reputation for being an odoriferous insect repellent. Actea simplex belongs to the Atropurpurea Group. 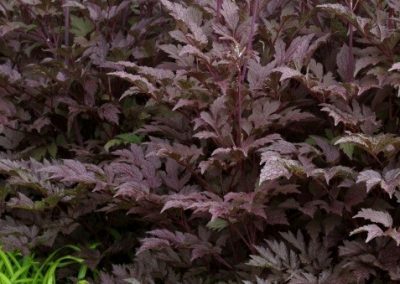 They are clump-forming, rhizomatous herbaceous perennials with compound leaves and small flowers in short, erect, simple or branched terminal racemes. These followed by berries, or by star-shaped clustered brown follicles. Actea simplex plants are also sometimes commonly called ‘Cohosh’ which comes from an Algonquin Indian word meaning ‘rough’ in reference to the appearance of the plant rhizomes. 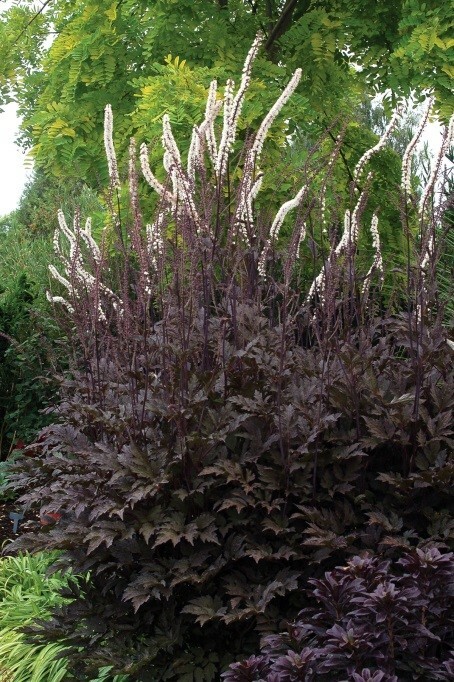 Actea simplex ‘Black Negligee’® is a bugbane that grows to 1.80 meters tall. The spread is 50cm. The flower spires add architectural presence to shaded borders. 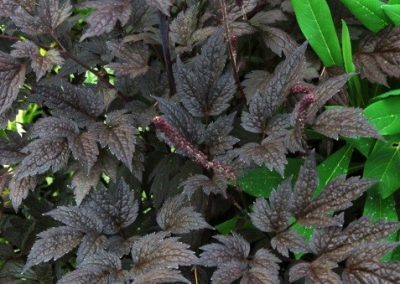 The ferny dark foliage provides excellent texture and colour to the landscape throughout the growing season. 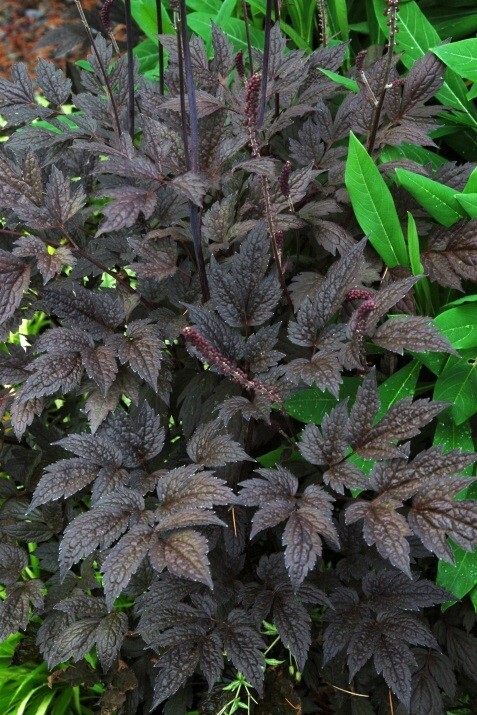 Actea simplex ‘Black Negligee’® is an ultra- hardy, simple to grow low-maintenance plant. No serious disease problems are known. When in bloom, the tall flowers spires do not require staking, but may benefit from some support particularly if not growing in a sheltered location. 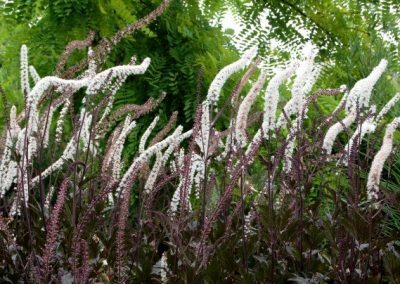 Flower spires tend to bend toward bright light when plants are grown in substantial shade. 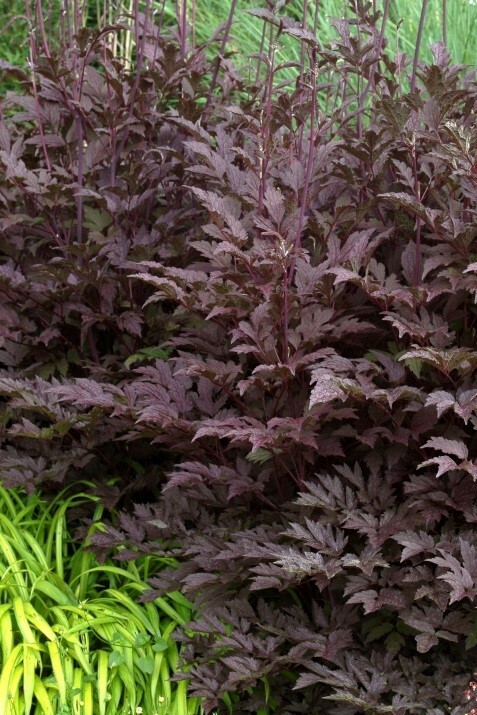 Plants can be grown in shade or sun.